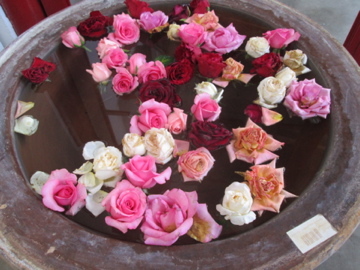 It’s been a long time, several months, since I have added a post to my blog. I’ve been happily preoccupied with finding, and now decorating a new house, giving me lots of time to ponder many matters. I was first introduced to the idea of “mindfulness” decades ago, probably first from the Alan Watts book, The Art of Living, and then later when I learned of the practice of “self-witnessing,” or self-monitoring one’s feelings, thoughts and sensations. Initially I had trouble with the concept because it seemed narcissistic to me, a form of over self-involvement. My understanding of the concept has evolved over the years and become more palatable by simply using the word “mindfulness.” In one of my favorite books, Wise Heart, Jack Kornfield puts it simply by defining mindfulness as “receptive, non-judging awareness.” However it is defined, I contend there is no better exercise for the practice of mindfulness than the experience of living in a foreign country. 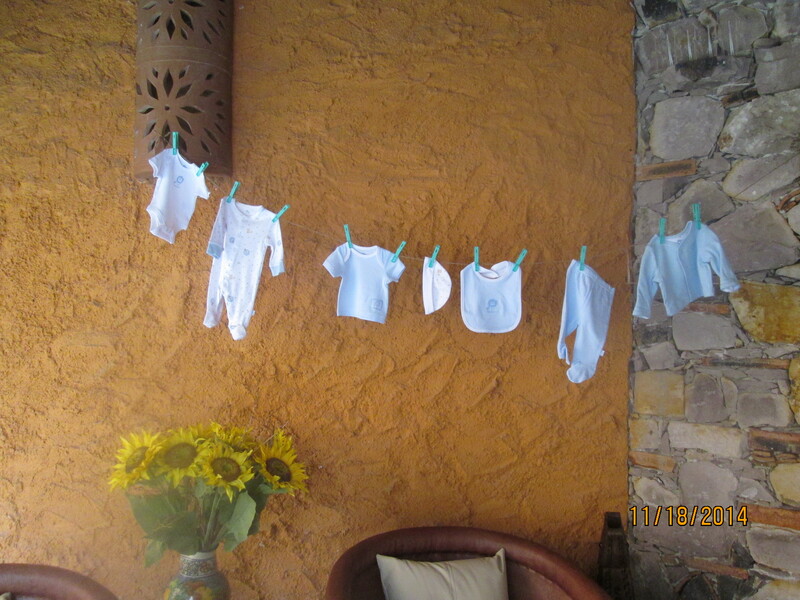 Out of the United States for three and a half years now, and in Mexico for over two, living the life of an expat brings a consistent, heightened awareness of virtually everything — the smell of the air, the sound of foreign tongues, the constant realization that this is a different life, wrought from a different culture. Attentiveness to the present, characterized chiefly by curiosity, is not only a choice but in foreign lands almost a necessity — a moment-to-moment awareness of what is in front of one, be it cobblestones to navigate or the sight of Aztecs reenacting ancient dances. I keep expecting that this sense of alertness will diminish over time as I become increasingly comfortable and familiar with Mexican life. Certainly it is not as it was initially when every scene that visited my eye was new and alien; yet happily the sense of wonder continues to persist. There is of course a downside: a certain fatigue borne of the keenness of one’s observations. When I think of my last visit to San Diego, I remember the deep comfort from being in the familiarity of my “homeland”; of sinking into my favorite chair in my brother’s living room and not wanting to move. Of knowing that if I ventured out, I would not have “issues,” i.e., I would be able to communicate effectively and, presumably, achieve whatever goals I might have in mind. When speaking of the joys of life as an expat with one of my friends in Marin County, she opined that for her the sense of community she enjoys would be painful to leave. It gave me cause to ponder what we mean by “community.” Perhaps because I lived a somewhat nomadic existence as a child — which trend has continued through most of my adult life, I don’t quite share those concerns. 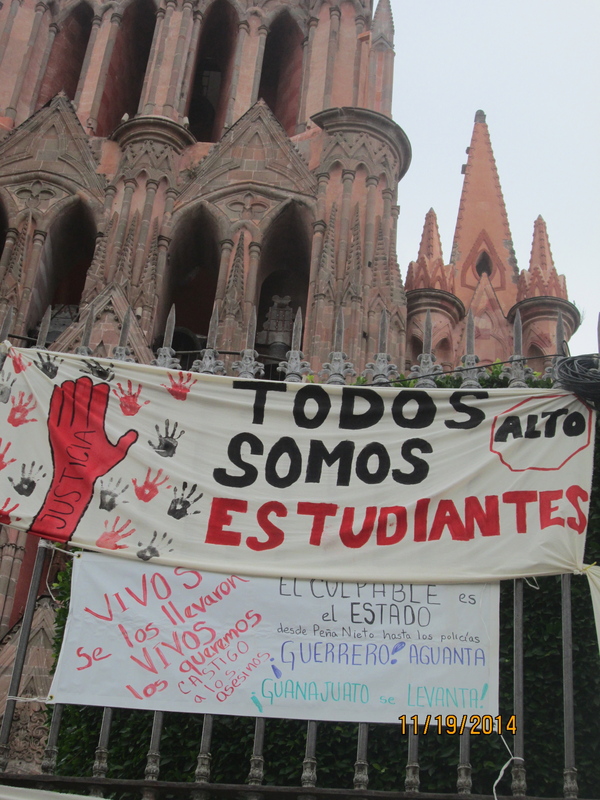 Indeed, in some sense I feel more a sense of community here in Mexico than ever before. That may be related to many factors but the most obvious ones that come to mind are the absence of a car and the presence of a dog. As a California girl fully enamored by the car culture, the thought that I would ever be without a car of my own was incomprehensible. Since the ’54 Ford that I first drove, cars have always symbolized to me both independence and freedom. My thinking has changed to such an extent that I have lost all desire to own a car and now sympathize with those who have to deal with car repairs, insurance issues, licensing, etc. 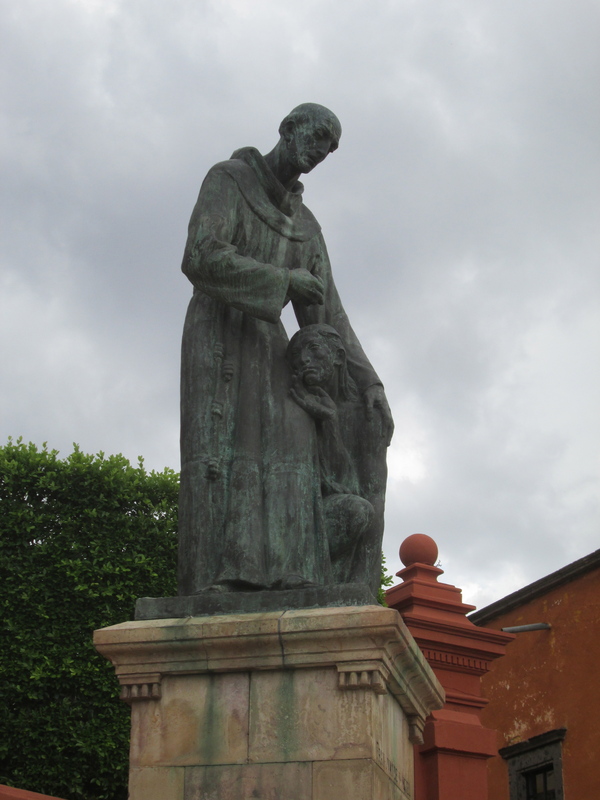 Speaking of licensing, when I first came to San Miguel I was puzzled by the number of South Dakota license plates that I saw; why, pray tell would so many people from South Dakota find their way to San Miguel de Allende? I finally discovered the answer when someone told me that you can register a car in South Dakota without having car insurance. Thus, many expats from many different States register their automobiles in South Dakota and then purchase Mexican car insurance when they arrive here, saving them the cost of insurance required for car registration in most if not all other States. But I digress. Okay so yes, there are times when I wish for a car for a trip to Costco or Home Depot in Celaya or Queretaro, 45 minutes away, and I imagine there is another car in my future someday. But the green and white taxis that whisk me around town for 35 pesos are more than sufficient and I never get stuck in traffic or have to worry about finding a parking space. And then there is the dog. There are several construction sites that Oliver and I pass on a daily basis. When they see us, there is a unison of voices in greeting, “Oh-lee-vair.” They don’t know my name but they know his. After walking with one of my Mexican friends for several blocks, she inquired, “Is there anyone in San Miguel that doesn’t know Oliver?” Probably not. He is a handsome fellow and English Cockers are a rarity here so he gets much attention. At the bakery each morning we are welcomed by the owner who automatically bags my daily croissant as we discuss the morning’s weather. In the park we greet other dogs and their owners, or give restaurant advice to tourists. On our way home we stop first at the flower stand to see the day’s offerings, then Oliver pulls me into the Cava Deli where, if he is lucky, he receives a piece of cheese. Closer to home we visit with the mechanic whose shop is across the road from our old house (while he and I chat, Oliver chases his cats); the man in the Tienda de Pollo (chicken store) sees me coming and knows what I will ask for, often having it ready before I order. Sometimes as we are walking down the street, a car will drive by and someone will roll down their window and yell, “Oh-lee-vair”; often I don’t even recognize the driver. So “community” is an interesting word. There’s the dog community, the AA community, the gay community, the neighborhood community, the national and global communities; it’s a topic that has spawned much thought. 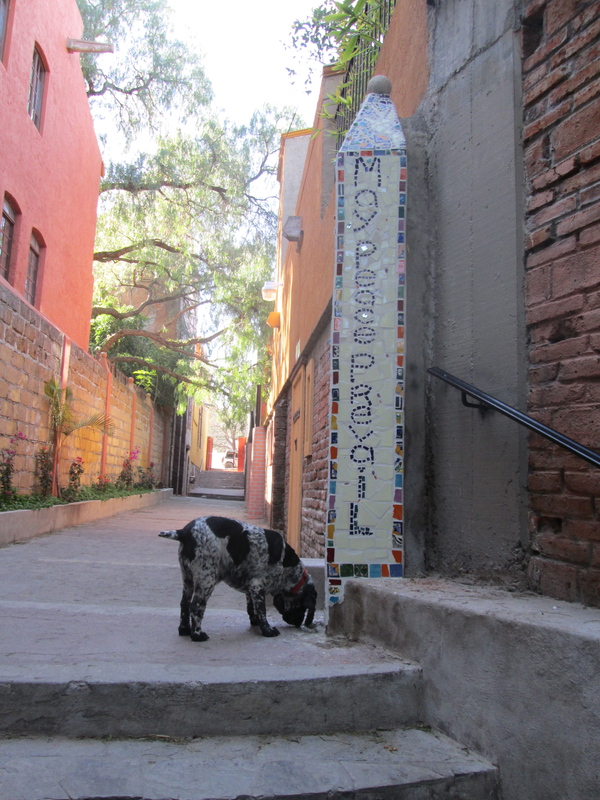 Here’s a shot of Oliver in the alleyway we walk several times a day, recently renamed Camino de Paz. I was doing a crossword puzzle but had the TV on and out of the corner of my ear I heard someone say something about the speed at which our “collective knowledge base” doubles. I wasn’t listening closely but they reported that at some point in the past (maybe the 17th or 18th century) our collective knowledge base doubled every 150 years. Allegedly it now doubles every two years; by 2020, it is predicted to double every 72 hours. When I discussed this with my friend Tom he mentioned a science fiction book he had read where everyone had “information sickness.” Could it be that the exponential growth rate of scientific knowledge will outpace the rate at which we can assimilate it? Indeed, do we have the cognitive capacity to keep up? And if it’s changing so rapidly, is all “knowledge” provisional? This reminded me of a speech my brother gave at his daughter’s wedding in which he reflected that as he aged, he knew less and less. And if we define science as knowledge about the physical world, will there be a time when science will have learned all it can learn? Then a few nights later I was watching a program about NASA in which it was suggested that the most significant accomplishment of NASA in all of its years of existence is not the moon landing but the shuttle program for its ability to fix and improve the Hubble telescope. The claim was that through the Hubble telescope, we have learned more about the universe than all the combined knowledge that had preceded it. And later that same evening I watched a program from Canada (our television is transmitted via Canadian satellite) about the philosophical question of Free Will vs. Determinism. Although I studied such questions in college, it was interesting to be reminded of the age-old argument. The laws of determinism have formed the basis of science, from classical mechanics to quantum mechanics and beyond. Yet to endorse determinism is to deny our daily conscious experience of free will — every day in multiple ways we “choose” to act, to take a walk, to buy a newspaper, to send an e-mail to a friend; is free will only a trick of the brain? I like the definition of free will as, “I am able . . .” which made me think of all of the things of which I am “not able.” There are physical impediments (i.e., I am no longer capable of climbing Mt. Kilimanjaro) as well as mental impediments (i.e., if bitten by a dog as a child, I may have an abiding fear of dogs). Having some acquaintance with addiction, I wonder now if, for example, a heroin addict is “able” to quit. I like the jargon of philosophy, i.e., “causal sufficiency” — and was particularly struck with the idea that what is determined is not necessarily inevitable. If someone throws a brick at my head, was the idea that the brick would hit me “determined” but, if I duck, not necessarily “inevitable”? As I ponder these matters I am reminded that my first husband accused me and my kin of being full of “hot air”; as opposed to actually accomplishing anything. (He was an accomplished engineer, complete with pen protector, and had little regard for this kind of thinking.) All these years later, I still remember and consider his remark. After all this, some of you might have to agree with him. 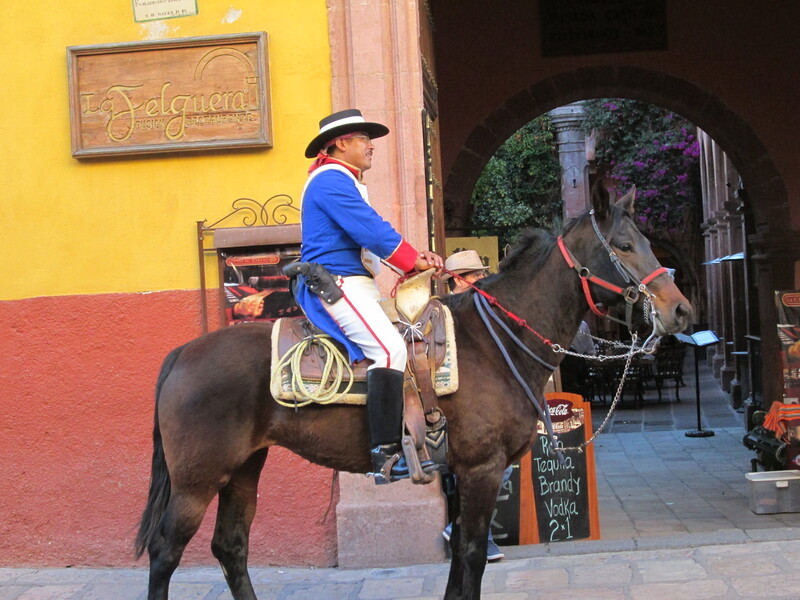 For those of you who follow this blog because of your interest in San Miguel, I apologize for my current introspection. At the moment I have little to add about San Miguel beyond what I have already written over the past two years. It is truly a magical place, and continues to enchant us. Oh, and because I do keep up with the news of the world I am aware that immigration is currently a hot issue. One of my friends here was recently deported from Mexican for not having the proper visa. It is surmised that someone reported him because a group of policemen came and arrested him and took him to the border the same day. Sadly his dog was left behind but they have now been reunited when friends put the dog on a plane bound for Arizona. 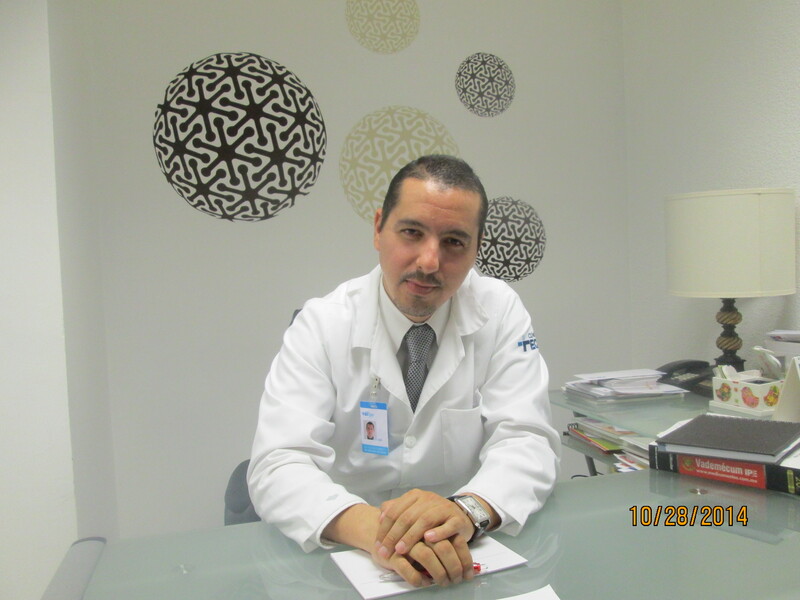 Obtaining the proper visas can be challenging and require proof of income, etc. From our observations it appears that San Miguel has become the Carmel of Mexico. The weekends bring large numbers of Mexican tourists and the Texans (who are traditionally here in August) are beginning to arrive. The Jazz and Blues Festival is about to start as well as the International Film Festival. There’s always something happening. All is well. 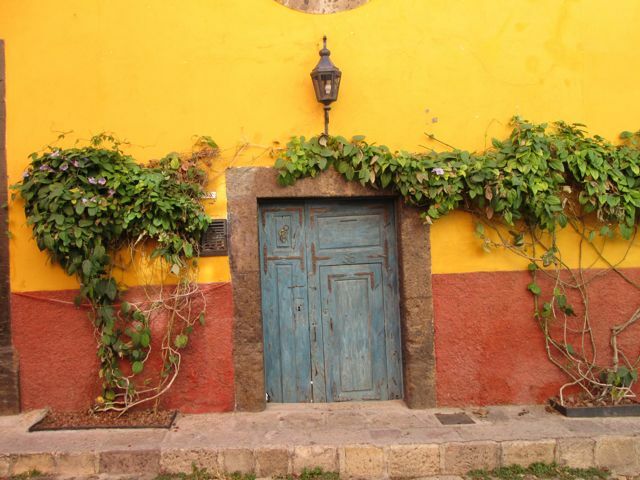 In their 2013 annual survey, Conde Nast has chosen San Miguel de Allende as the number one city in the world. For those of us who live here, initial pride and pleasure were mitigated by surprise and disbelief, especially in light of the runners-up. Florence, Italy and Budapest, Hungary were tied for second; Salzburg, Austria garnered the number three spot while San Sebastian, Spain tied with Charleston, South Carolina for number four — behind which trailed Vienna and Rome. In the expat community there has been speculation that money may have changed hands. It reminded me of a Christmas more than 20 years ago when, largely based on the recommendation of Conde Nast who had named it the number one resort that year, we elected to spend our holiday in Coeur d’Alene, Idaho. Among other failings, it was too cold to ski and the bars were closed on Sundays; not our most memorable holiday. When I last checked in, San Miguel was preparing (and I was bracing) for the only annual festival that I had yet to witness: La Alborada, an homage to San Miguel’s patron saint, the Archangel St. Michael, held each year at the end of September. While as anticipated it lasted all night, it was a fine celebration in which Catholic and pagan practices merged inseparably. Pre-Hispanic dancers moved to the rhythm of ancient drums and the early morning sky (3 a.m.) was bejeweled by nearly continuous fireworks. 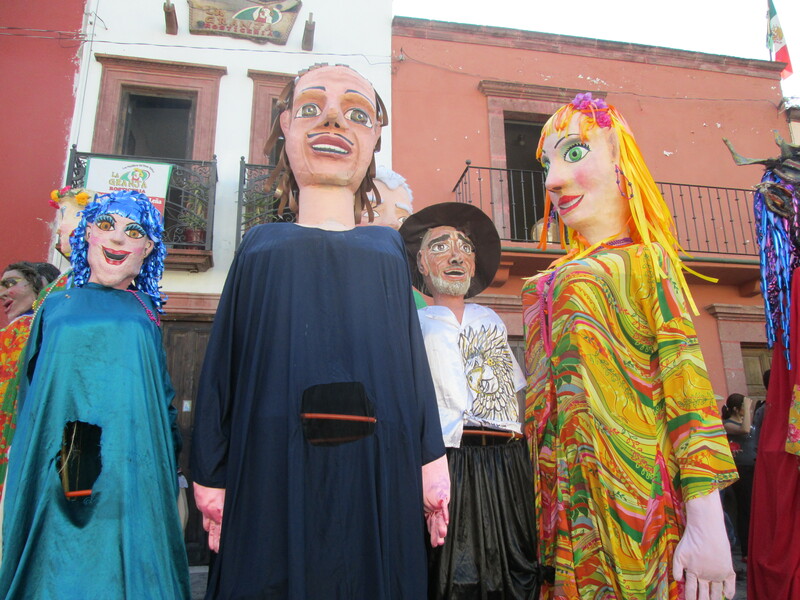 Giant puppets are a common sight in San Miguel, particularly as an element of wedding celebrations, yet are never seen in such numbers as they are at La Alborada. These smiling, grotesque giants fashioned of papier-mache and cardboard date from the conquest when the original images were of kings and queens with a few saints thrown in. These days they often represent the defects of both public servants and celebrities — or just silliness. Although I failed to get a photograph, one of the final events of La Alborada is the procession through town of the statue of St. Michael, taken from the highest part of the altar in the Parroquia, and carried through the streets to the other main churches. This image of St. Michael, wearing armor made of sterling silver, is over 100 years old and represents his physical presence in the town of his name, allowing the populace to view him up close once a year. 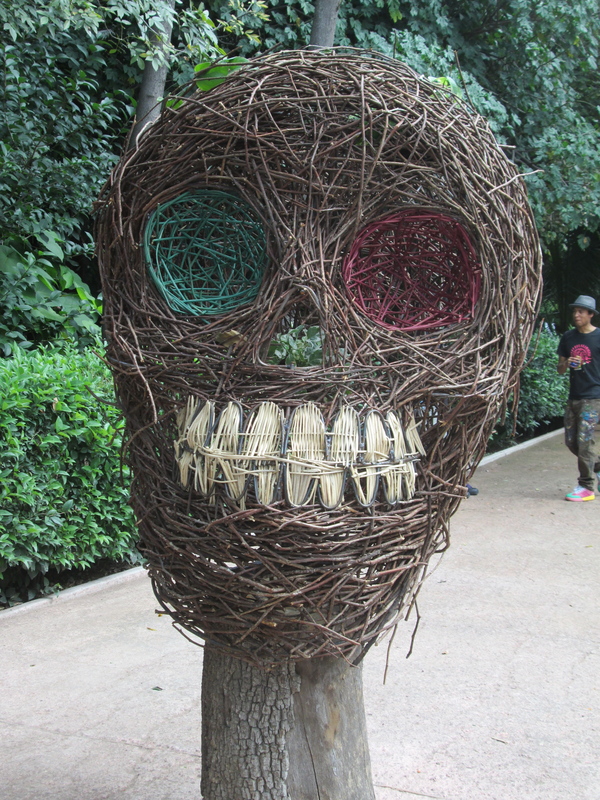 September gave way to October when everywhere one could see preparations for Dia de los Muertos, the Day of the Dead, an event I wrote about in some detail last year. 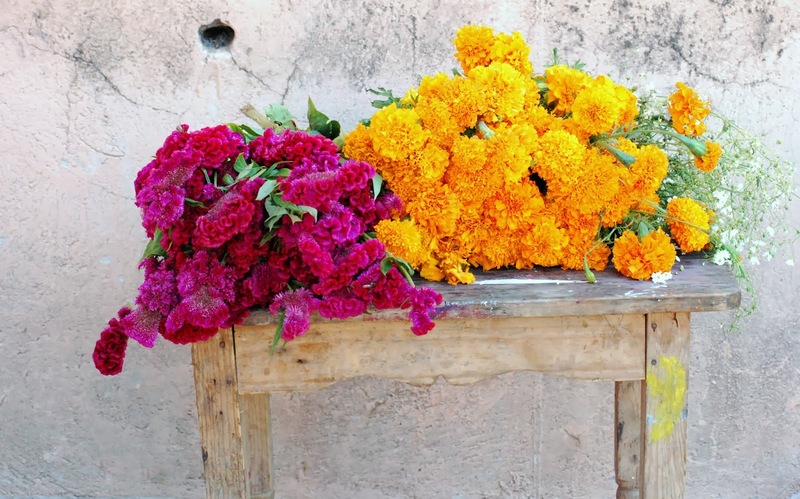 Parks and public squares, sidewalks and cafe windows, all began to display the marigold flower, known as the flor de muertos, the flower of the dead. 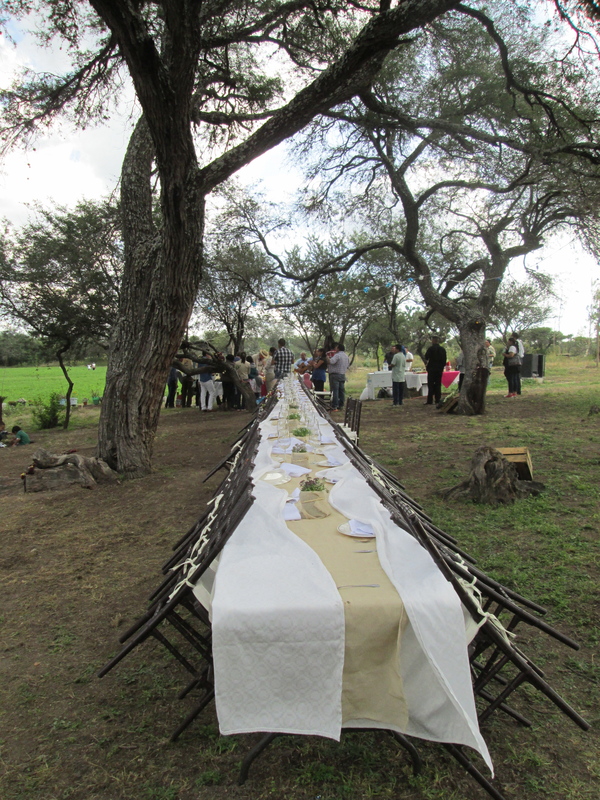 But before that event, at the end of October our good friend Andres celebrated his 35th birthday at a party on his ranch, just outside of town, and we were among the invited guests. The party began mid-afternoon — and in typical Mexican fashion, went on into the night. Mariachis were in attendance as well as numerous adults, children, goats and dogs, including our Oliver. 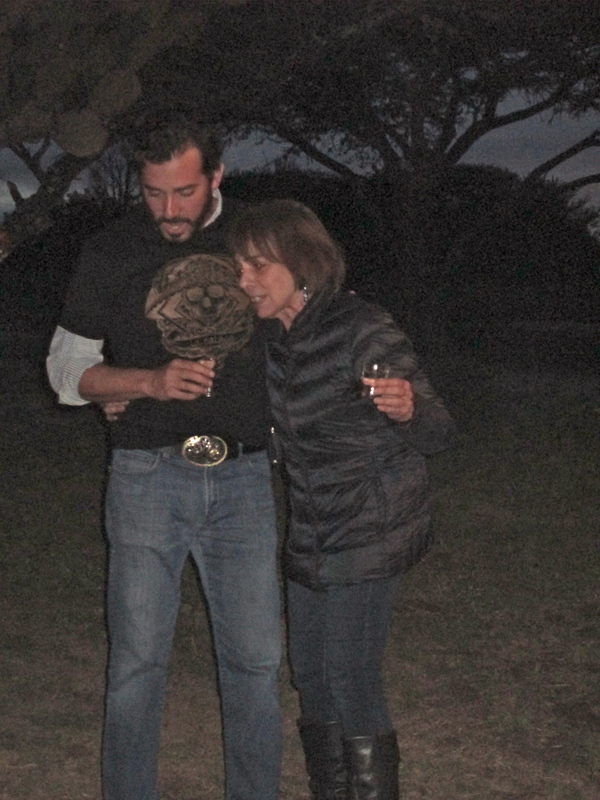 Here’s a shot of Andres and his mother Carmen singing after imbibing a few tequilas. It was a memorable event. 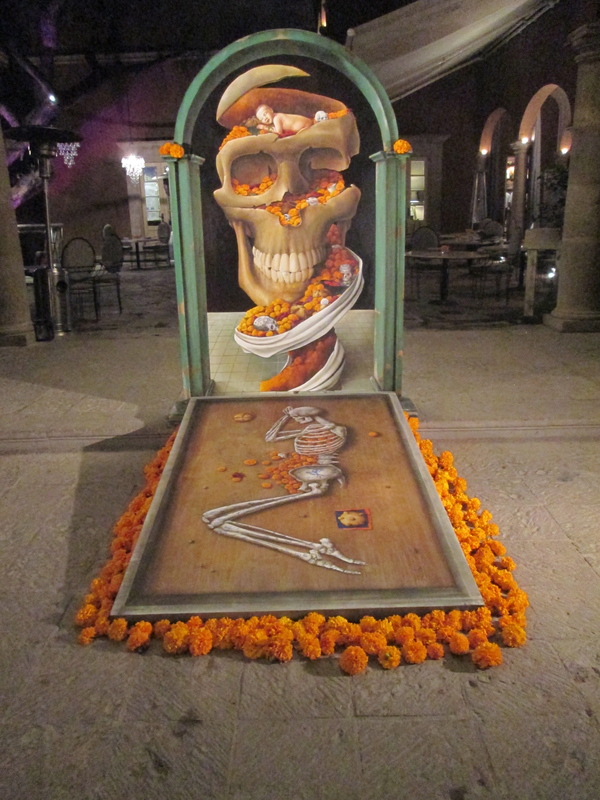 And then a few days later it was time for Day of the Dead. 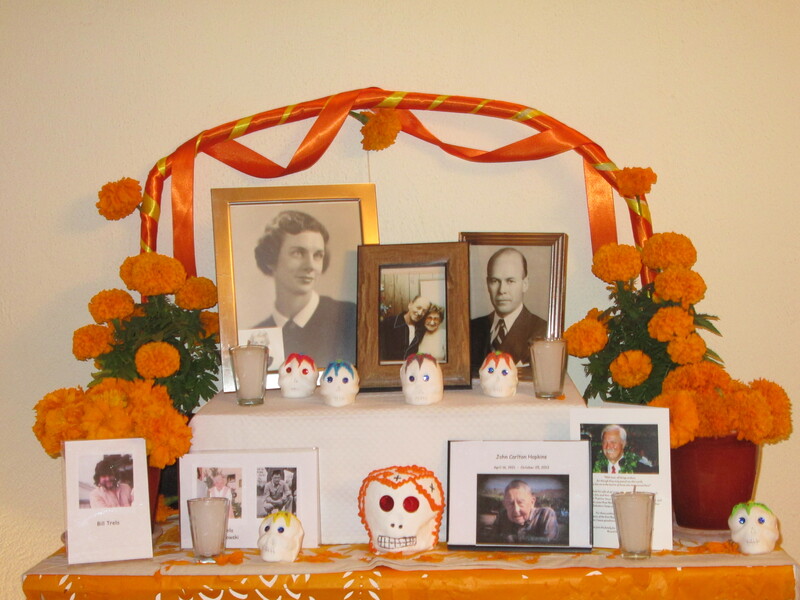 This year, instead of merely observing the various aspects of the celebration, I elected to “participate” by constructing an altar, an ofrenda, in the Mexican tradition to honor our dead — or, as they say in Mexico, to pay homage to those who are “ahead of us in their journey” — and to invite them back for a visit. First I had to find sugar cane, traditionally used to fashion an arch over the altar, the arc of which represents the journey from birth to death. Then I purchased various required items such as candles, incense, sugar skulls and the ever-present marigolds, the scent of which is allegedly enticing to the ‘other’ world. 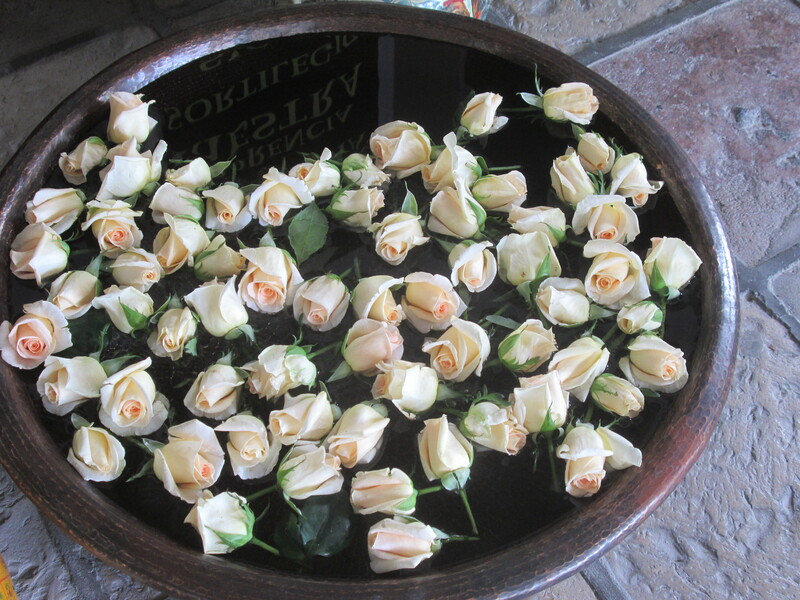 Another traditional element is to add food and/or drink that the deceased especially favored, another incentive for them to visit on that day; hence, many altars are replete with bottles of tequila or mescal. My mother favored Hershey Bars with almonds; I was sorry to realize I know so little about my father than I had no idea what his favorite food might have been. In addition to my parents and those of my husband, we included the Trela family, relatives of our San Miguel friend Tom, as well as my nephew’s beloved father-in-law, John Carlton Hopkins, “Jack,”, who died on October 25th. We also included Peter Sansevero, my husband’s long-time friend and mentor who died on September 14th. The process of constructing the altar is a ritual I will continue in years to come, although in modified form (the sugar cane was difficult to fashion). If nothing else, it gave me an opportunity to reflect from whence I came. Now that I have experienced the Day of the Dead for the second year in a row, it has become clear to me that I understand but little. In response to my myriad questions about culture and meaning, my friend Andres will often reply “It’s complicated.” And so it is. The autumn has brought me yet another gift with the rediscovery of old friends. It was in the fall of 1967 that I first met Sterling Bennett, a young and new German professor at Sonoma State University in Northern California. Years later, in 1980, I met Dianne Romain, a professor of philosophy with whom I studied. My friendship with both of them grew through the 80s until life took us in different directions in the 90s. I had learned that they were retired and living in Mexico and I recently discovered they are indeed nearby, living in the city of Guanajuato, an hour’s drive away. We hooked up for lunch one day recently when they visited San Miguel and it was just as one would hope: the conversation just continued where it had left off although, granted, there has been much activity in the intervening 20+ years since last we were together. Although we covered a lot of territory, I woke up that night thinking of all the things we hadn’t talk about such as Sterling’s novel, Playing for Pancho Villa, of which reviewers have opined, “With prose as stripped down and unforgiving as the Chihuahua Desert itself, this novel is at once a gritty historical adventure, a haunting story of relationships and love, and a story that dares to confront the reader with unanswerable questions.” Sounds like a book I need to read. He also has a blog, http://sterlingbennett.com, subtitled, “Stories from Mexico and other yarns.” Dianne has accomplished much in the intervening years (which she didn’t mention but which I have since learned) and also has a blog called “Writing in Fits and Starts” — a title to which I can well relate. She can be found at http://writinginfits.com/. I am excited to have made this re-connection; it is not only delightful but deeply satisfying to look into the familiar eyes of old friends with whom there is shared experience and I am happily anticipating our next rendezvous. There are no more major fiestas scheduled for November so we can concentrate on our own: Thanksgiving. We eagerly await the arrival of one of our most reliable and faithful old friends, Marie, who for many years has rarely been a stranger at our Thanksgiving table. She and her friend Dan will arrive on the 26th, and be with us for nearly a week, a week we are happily anticipating. And speaking of Thanksgiving I am reminded of a quote I wrote down long ago (with apologies to its author whose name I failed to note). Speaking of a vision for tomorrow, . . . .
Last year while on our daily walks to the park, Oliver and I routinely passed a handsome hacienda where some kind of construction was underway. We peeked in one morning in late summer and saw tables and chairs and learned that Calenda Restaurant, the newest addition to the lively San Miguel restaurant scene, was about to open for business. Thus, we became among its first patrons and were greeted by its owner Karen, a beautiful young woman and professionally trained chef with a successful restaurant in Mexico City. The food was far and away the most innovative we had yet encountered, five-star quality without five-star prices, so we became ‘regulars.’ Shortly thereafter Karen and her delightful beau Andres rented a house just around the corner from us and acquired a puppy, a chocolate lab named Toro who took a liking to our dog Oliver. Increasingly enchanted by San Miguel, over time Karen decided to close her Mexico City restaurant and she and Andres now live full time in San Miguel, recently acquiring land on which they are raising goats (for goat cheese), alfalfa, zucchini, corn, etc. Our friendship has grown and deepened over the past year, age and cultural differences notwithstanding, and we now count them among our closest friends. 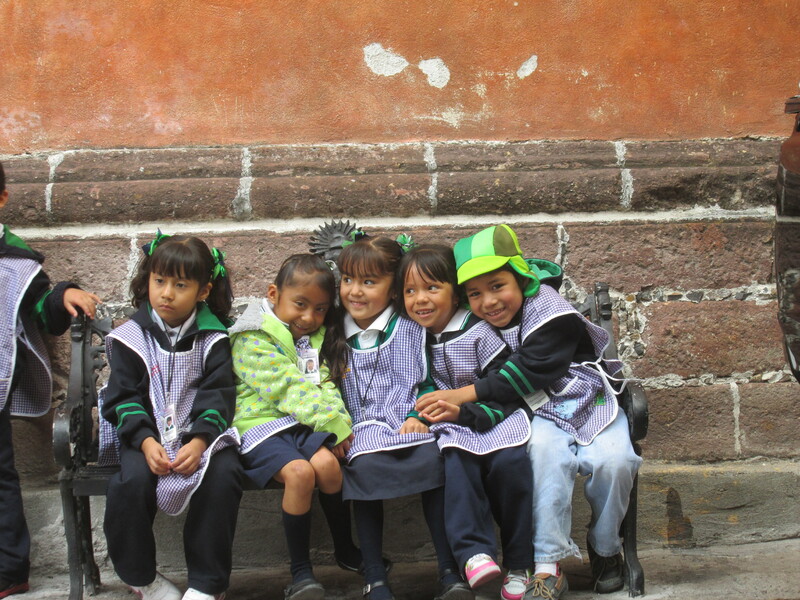 They introduce us to their friends as their “San Miguel parents” and we have now met both of their families and a variety of their other friends who frequently visit San Miguel from Mexico City. It is a great privilege to be allowed into the inner circle of a Mexican family and to acquire Mexican friends, of whom we now have several. Because Karen and Andres both speak excellent English, and no topic is off-limits, they have given us a unique perspective about the country and its culture and have greatly enriched our experience of being here. The first Sunday of September found us piling into Andres’ Volkswagon SUV, dogs and all, for a seven hour road trip over the mountains through the State of Jalisco to the State of Nayarit, passing through Guadalajara, the capital of Jalisco and the second most populous city in Mexico. Our ultimate destination was Sayulita, a seaside village some 395 miles from San Miguel, located 25 miles north of Puerto Vallerta, on a coastal corridor extending from Litibre to the historic port of San Blas known as the “Riviera Nayarit.” Sayulita has a mostly young population of about 4,000 and was not well known until the late 60s when the construction of a new road made it more accessible. Known for its consistent river mouth surf break as well as a breeding and birthing ground for Humpback whales, it is a haven for surfers and has an eclectic quality about it; it reminded me of the north shore of Oahu in the 60s, with shorts and flip-flops de rigueur. The rental house that Andres had secured for the week was situated up a small incline from the long, wide and spotlessly clean white sand beach, a few miles from town. With unique architecture, the living room, dining room and kitchen were open to the elements with only the two bedrooms enclosed by walls and doors. September may not have been the best month to visit since it was hot and humid, reminiscent of the beaches of Panama, with daytime temperatures in the 90s and 90 percent humidity. But the ocean temperature was perfect and most of the week was overcast, shielding us from the intensity of the sun. The bedrooms had air conditioning and rest was easy to come by, the rhythm of the surf lulling us to sleep. We spent a fair amount of time in the water, in the pool at the house but mostly in the Pacific, home to the largest pelicans I have ever seen. Oliver, who grew up on the edge of the San Francisco bay, seemed delighted to be reintroduced to the ocean and I felt as if I could actually watch his brain work as he became reacquainted with the waves, re-learning when to turn his back to the surf, when to turn sideways with all four paws firmly planted, and when to go for it, splashing into the wave, going after the stick. 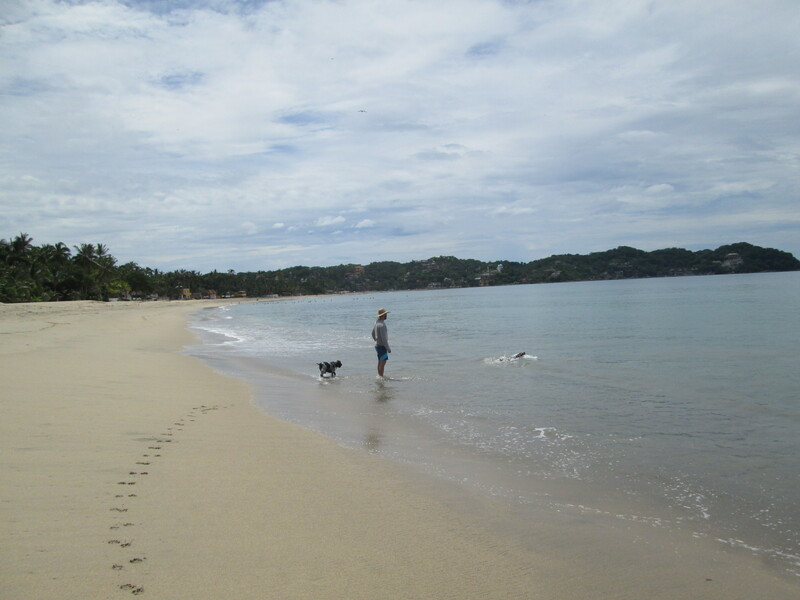 We made various excursions into town, a few times in the car but mostly walking at the water’s edge with the dogs in tow. The purpose of the trip was a combined birthday celebration: Karen turned 28 while we were there, and both dogs had August birthdays just past, Toro turning one, Oliver seven. On the eve of Karen’s birthday we went to the Four Seasons for dinner, located at Punta Minta, a short 20 minute drive from Sayulita. The food was excellent, the live music memorable and the ambiance elegantly understated. 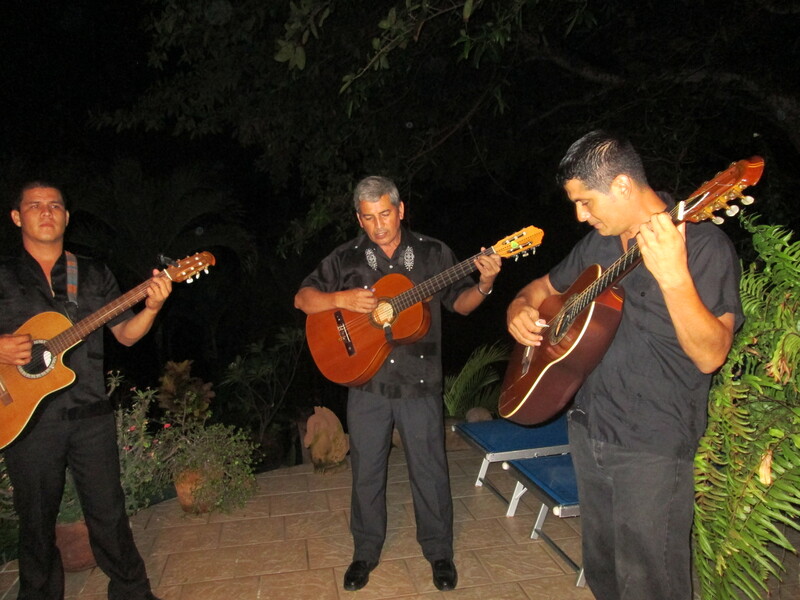 We got back to Sayulita around 11 and just after midnight Andres had arranged for mariachis to come up the beach, serenading Karen on her birthday. 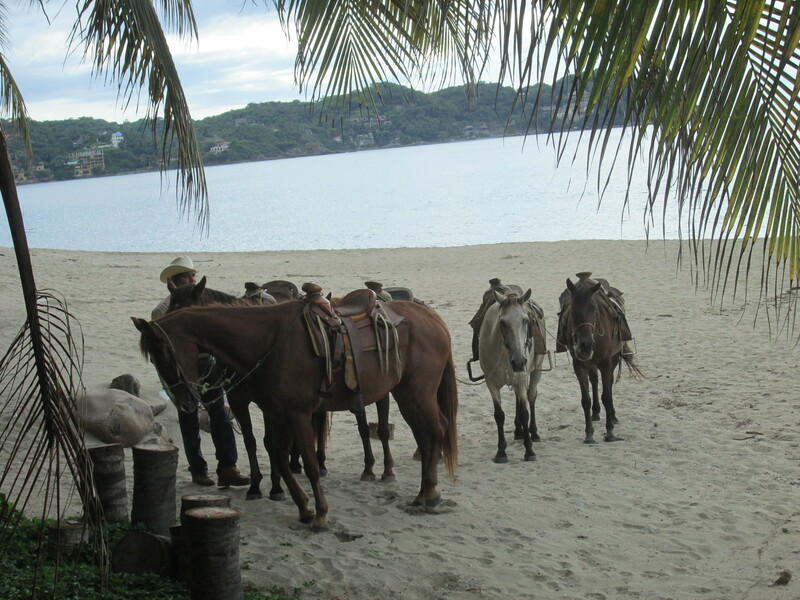 The next day as part of the birthday celebration, Andres had arranged for horses to be brought to our beach late in the afternoon and we took a lovely ride, first on the beach and then through the jungle-covered hills that tumbled down to the sea. When we returned from horseback riding, we found a chef in our kitchen preparing a special birthday dinner with fresh lobster and shrimp; it was fabulous! 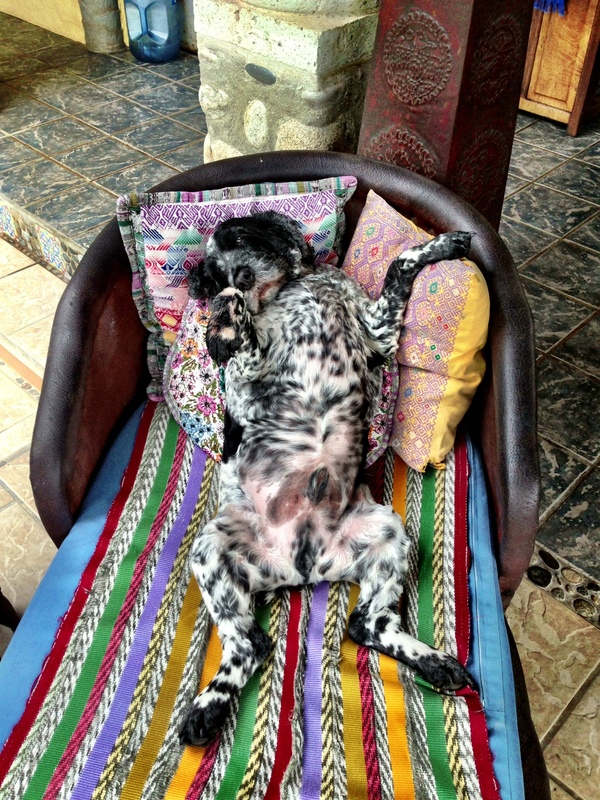 while Oliver got into the beach lifestyle quickly. 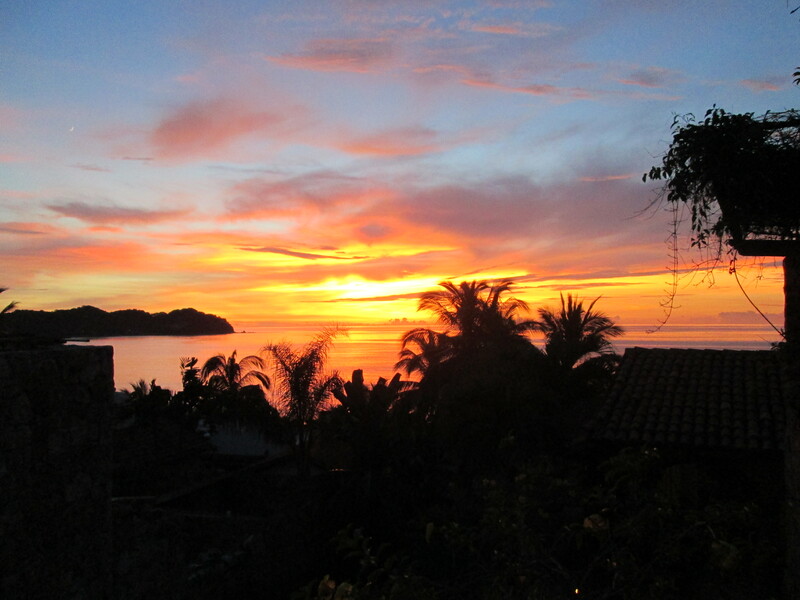 But my favorite photo from the entire week was the sunset we saw on our last evening there. The week sped by and Sunday morning found us packing the car, with suitcases strapped to the roof, retracing our route back to San Miguel, taking us over mountains and through valleys lush with green. There was so much green I was reminded of an anecdote about Georgia O’Keeffe who left her New Mexico landscape each year to visit Lake George in the State of New York. Over time she developed an aversion to the color green, so prevalent in the Adirondack landscape and once wrote to another painter that, “I walk much and endure the green and that is about all there is to it.” A singular person indeed. But I digress. The green finally gave way to fields of blue agave, the rust color of sorghum and the ever-present acres of corn, Mexico’s primary crop. 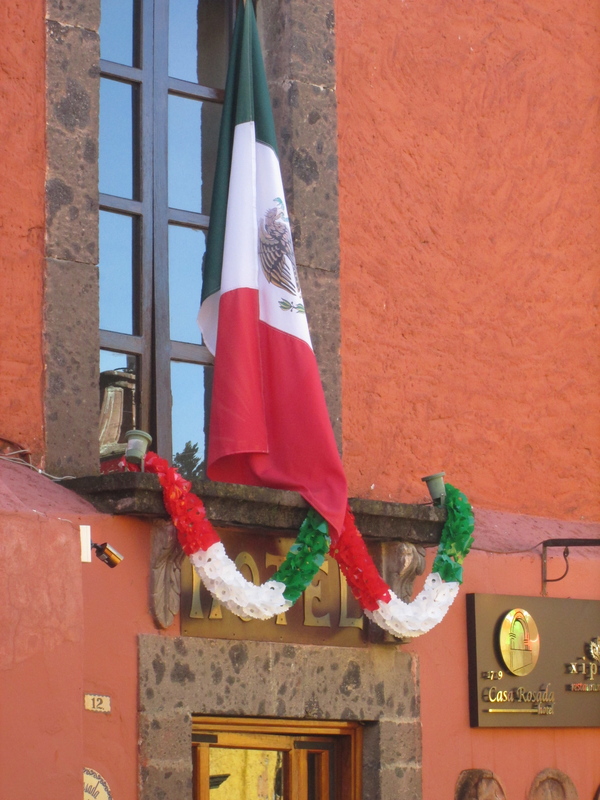 Home again to the cooler climes of San Miguel, flags were a’flying as the city prepared for the independence day celebrations, an event chronicled in detail in this blog last September. This year the celebrations were somewhat muted, courtesy of both Hurricane Ingrid and Tropical Storm Manuel, but because San Miguel now has a live webcam in the Jardin Principal, I was able to view the festivities from the comfort of my bed via my laptop computer. As I write this San Miguel is preparing (or bracing itself) for El Dia de San Miguel, also known as Alborada which can mean “Song of Dawn” or “Battle of Dawn” in honor of San Miguel’s patron saint. St. Michael, one of three archangels mentioned in the Old Testament, was reportedly victorious in his battle with the devil (a battle which must have occurred in the wee hours since this festival lasts all night long). I was mercifully in San Diego at this time last year so this will be my first experience of the all night celebration with thousands of rockets and fireworks anticipated. Sometimes I am asked what I like best (and least) about San Miguel. Without question fireworks are my least favorite phenomenon and I have yet to fully understand why it is such a huge part of the culture. Some say that it has to do with the Aztecs and their early morning prayer rituals. I’m also told that the Catholic Church, even in impoverished villages, spends an inordinate amount of money on rockets and fireworks because it is so important to the people. And the things I like best? Ah, there are so many. But if I had to pick just one I would say it is the sound of a muted trumpet, emanating from a not-too-distant jazz club, that I hear late at night while falling alseep. When I was in my 30s, living briefly on the south coast of Spain, I had a dream in which I remembered my immediate past life; in so doing everything made sense, each relationship, every stepping stone and stumbling block, each joy and every sorrow. The experience of living as an expatriate reminds me of that dream. I have had many disparate life experiences within a single lifetime, and while some of them appear unrelated to one other, there is a thread, a “me” that has been the experiencer, the witness of it all. Yet there is something substantially different about living abroad; the life I lived in California seems like another incarnation entirely, as though the thread that connected all my previous experiences has been broken — the needle now re-threaded addressing new fabric. Living in a foreign country is not only a re-location but also a dis-location, psychic as well as geographic. Some of you have commented that the tenor of my blog has changed, subtly during the 14 months in Panama but more overtly since moving to San Miguel, and has focused more on the external world in which I find myself and less on my inner experience of it. Why might that be? How did this blog start in the first place? Before I left California my friend Linda suggested that I start a blog. At the time I didn’t know what a blog was; I gave the matter no further thought. Then when our friend Marie came to visit us in Panama, along with the gift of this laptop, she brought the encouragement and the technical know-how to set up a blog. I originally thought of it as a time-saving device; instead of sending 10 e-mails to my family and closest friends, I could write just one post. Over time, in ways I don’t understand, my blog was “discovered” by others whom I did not know and gradually the readership grew. 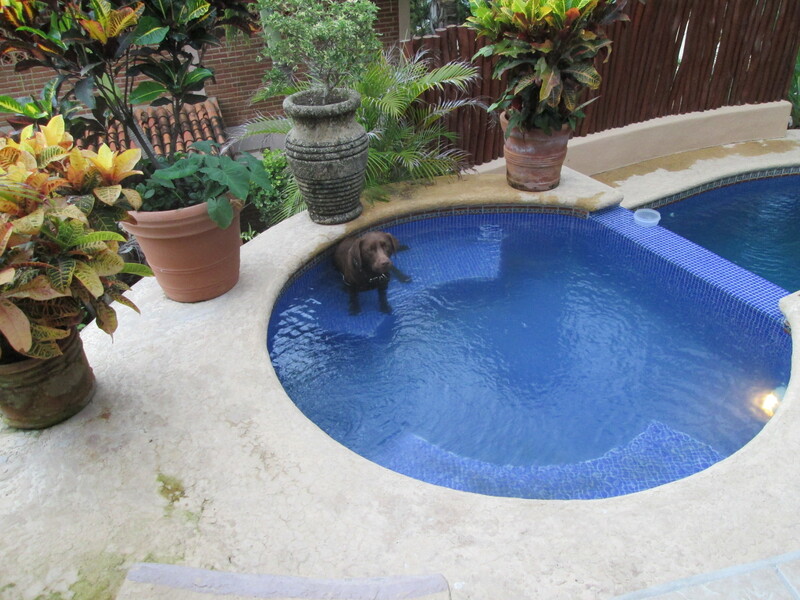 By the time we left Panama my blog had 78 followers, only about 30 of whom I knew personally. Since these readers didn’t know me I assumed they had subscribed based on their interest in Panama; thus I began to write more about what I saw and became increasingly shy about sharing my interior experience. 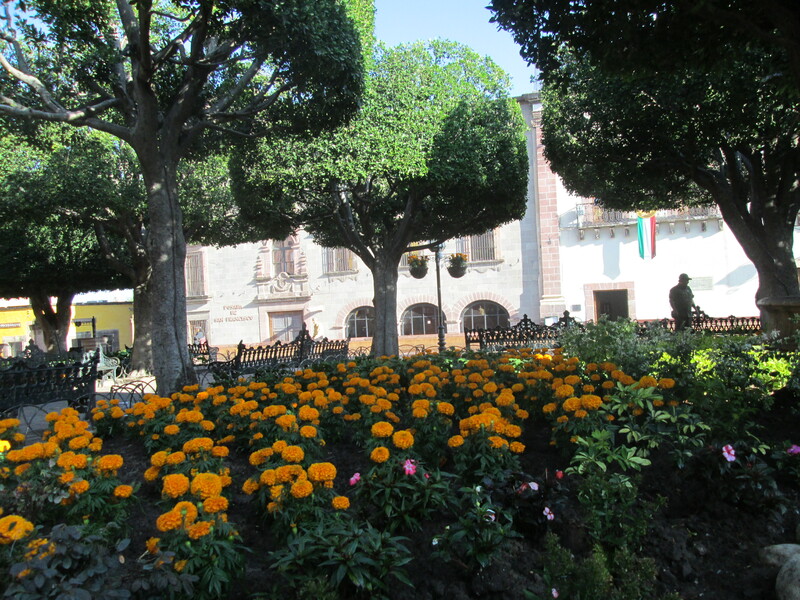 And then we moved to the colonial jewel of San Miguel, generally agreed to be one of the loveliest towns in Mexico. 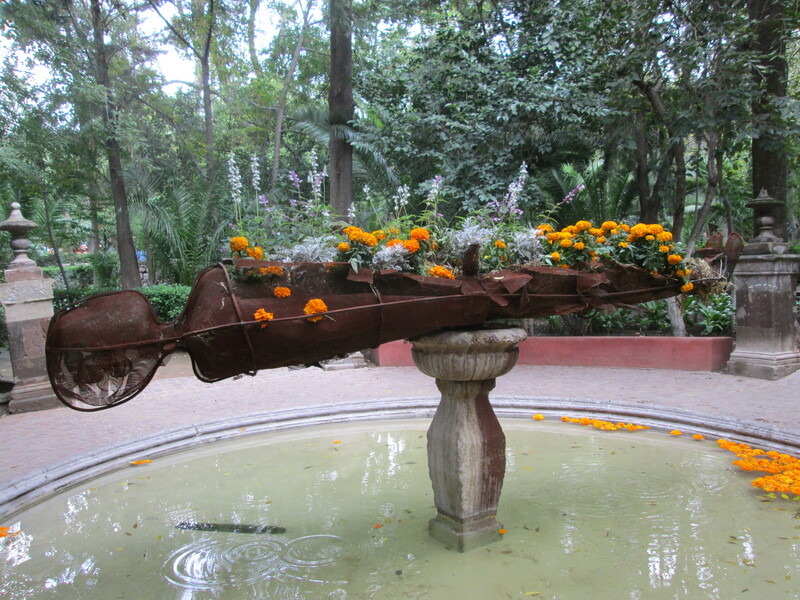 There has been so much to write about — the history, the architecture, the weather, the craftsmen, the artists, and an astonishing number and variety of fiestas which I have attempted to describe. 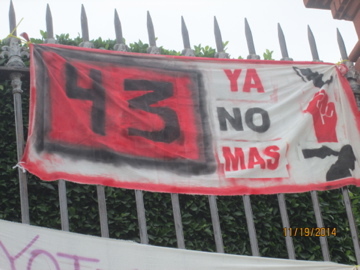 Again I have attracted strangers to the San Miguel blog and now have 47 followers, many of whom I do not know. To or for whom am I writing? 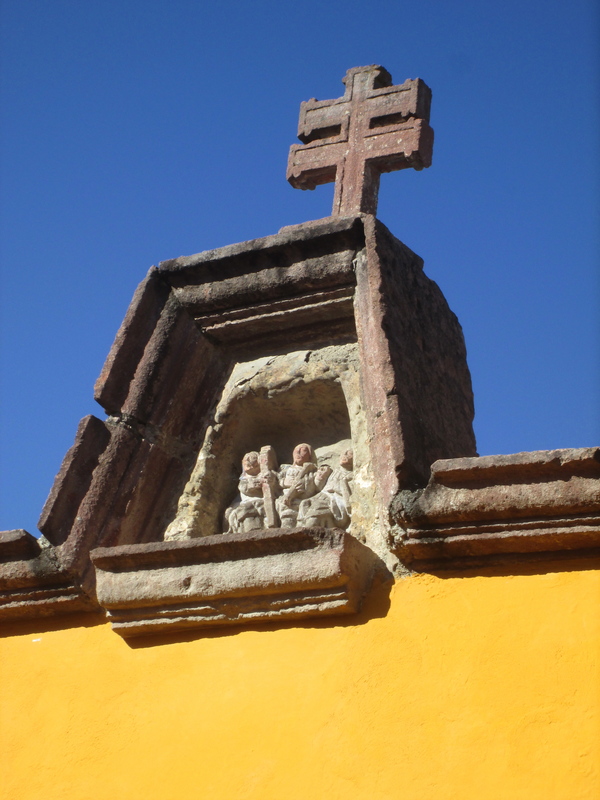 One of the interesting things about living in San Miguel is the sense of comfortableness combined with exoticness. Today, more rapidly than I could retrieve my camera from my backpack, I saw a Mercedes convertible followed by a burro ladened with bags of soil. There are often such juxtapositions in my daily life, ever reminding me of the unique nature of this experience. Now that an entire year has passed and we have experienced a full calendar of events and fiestas, I am reassessing the purpose of my writing. For most of my life I have been drawn to interior spaces, i.e., introspection and reflection. But the experience of living in a foreign country has triggered all my external buttons, enhancing my awareness of the larger world around me and refining my aesthetic sense. The loveliness of this dusty hillside town more than satisfies my ceaselessly hungry eye and I have tried to convey some of that beauty through the photos which I have included with previous posts. Life as an expat also engages the mind as I struggle to understand, however superficially, the language and the culture, and most of my reading this past year has been on the history and culture of Mexico. As time increases since I left the United States, I have the image of a cruise ship moving slowing away from the dock, connected to those on shore by paper streamers, breaking, one by one, as the ship moves further out to sea. Without frequent contact I no longer know the details of my friends’ lives — who went to the doctor, whose dog has died, whose sister has gotten married. With the lack of proximity the sense of “conversation” is gone. The exchange of ideas, the building of an hypothesis, an adjustment or correction of one’s point of view based on the richness of the conversation, these are things I miss. And to try to convey in an e-mail the nuances of one’s mind and heart is challenging at best and mostly impossible, at least for me. Of course it would help if I enjoyed speaking on the telephone but it is an instrument that I quite dislike — it seems unnatural to me. Now, of course, we have new friendships, different kinds of friendships. 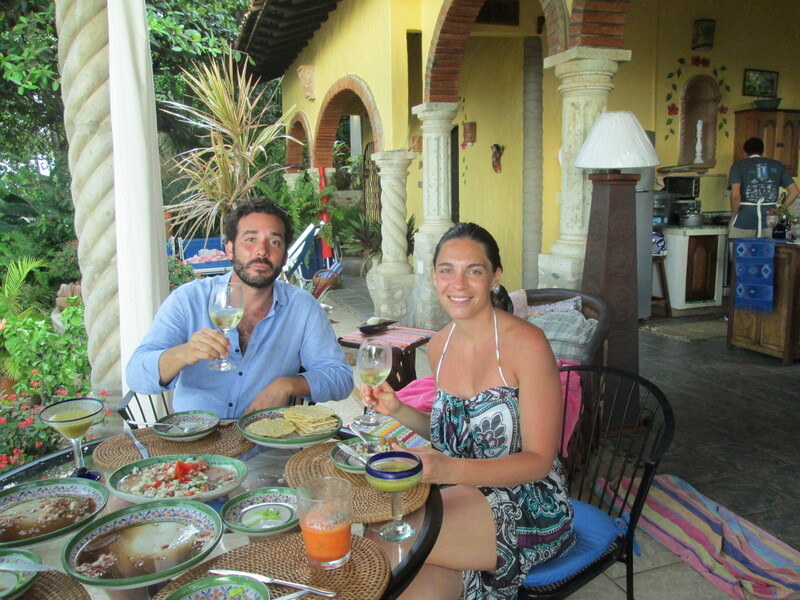 In some cases these new friendships are with Mexicans and subject to cultural differences. It is interesting to have friends, expat and Mexican alike, with whom there is no shared past — only the present. Which leads me to another aspect of expat life — the hightened sense that the moment is all we have. Whether I intended to or not, I have learned a great deal about the principle of mindfulness, or non-judging awareness. Separated from the familiarity of family, friends and geography, awareness of the discrete moment is heightened, and cherished. I will, of course, continue to write about San Miguel — how could I not? But I will also attempt to share more of the inner evolution that I am experiencing for it is indeed a different life that any that have preceded it. As I write this the sun has crested the hill, the air is lively with birdsong and it is 54 degrees with an expected high of 87 and afternoon thunder showers. It is Memorial Day in the United States but a typical Monday morning here. Another week begins; another adventure awaits.